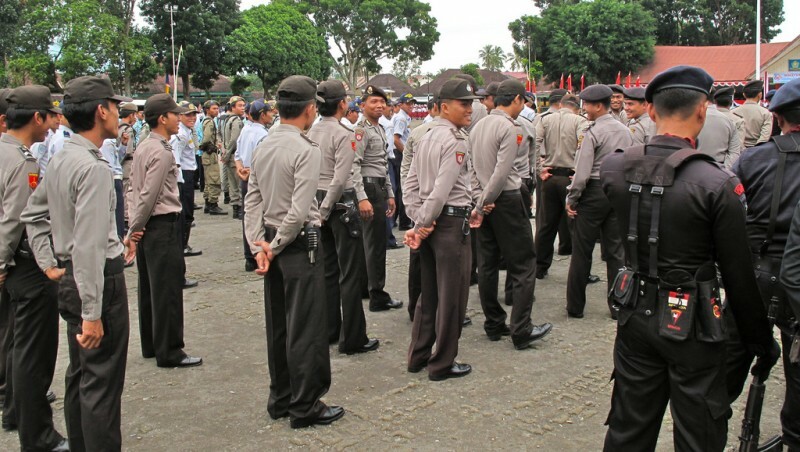 Will Indonesia’s Police Circular on Hate Speech Suppress Freedom of Expression? Indonesian police. Photo from Flickr page of Sbamueller. CC License. The Indonesian police has issued a new circular linking hate speech to the country’s criminal code. While the police say it is necessary to prevent social conflicts, some activists describe it as a threat to free expression. On October 8, the chief of police signed Circular No. SE/6/X/2015 on the management of hate speech (ujaran kebencian). The circular defined hate speech by citing several provisions already existing in the criminal code while broadening the scope of the crime. Hate speech now includes insulting acts, defamation, blasphemy (penistaan), objectionable acts (perbuatan tidak menyenangkan), provocative acts, instigation, and the dissemination of false news. The circular also listed the ways in which hate speech is disseminated: campaign speeches, banners, social media, rallies, religious sermons, electronic media and mass media. The police said the circular is intended to guide law enforcement on how to contain hate speech and avoid the spread of violence, especially religious conflicts. Indonesia has a bigger Muslim population than any other country in the world. In recent years, minority communities and some Christian churches have been attacked by hardliners and religious fundamentalists. We cannot afford to let these new technologies and digital tools to be misused and abused. A tongue can be like fire. Do not speak rashly. Reflect your culture through a positive use of words and language, and show that we are a well-mannered nation. Some activists, media groups, and lawyers were quick to criticize the circular as an unnecessary measure that could lead to human rights violations. I have my own concern about that circular. It indeed tells people to watch their tongues when it comes to spreading hatred. But it also says that there are legal actions for spreading hatred. That could be dangerous. Do we really want to go back to that period of time? What kind of democracy would that be if one expressed his opinions and then was sent behind bars? The application of the law here could result in wrongful arrest, as those who will end up being arrested will not be the actual perpetrators, and this will ultimately prove to be a source of tension. It is better to separate defamation from hate speech, so that police officers don’t end up abusing their authority as they attempt to handle such an obscure provision. …this hands the police a powerful weapon, allowing it to decide what can and cannot be categorized as hate speech, and is absolutely problematic and dangerous. People may think that the circular wants to limit the freedom of expression. It also could be considered as social control and it could be considered as being against democracy. Given too many questionable cases of insult and defamation, dropping the categories from the new circular would lead to better focus on hate speech. Irfan Abubakar, director of the Centre for the Study of Religion and Culture at Syarif Hidayatullah State Islamic University in Jakarta, emphasized that the circular does not criminalize the right of citizens to criticize public officials. The circular is important momentum for improved state protection of minority religious groups whose rights have too often been violated. But how far the circular is able to contribute to improved management of religious conflict depends on the commitment of police to actually implement the circular in the way its drafters intended. At the same time, police now have the tough job of responding to scepticism and misunderstanding in the community because of the widespread equation of hate speech with all forms of public criticism. It must be stressed that the circular was not intended to silence freedom of expression or smother democratic reforms. Rather, it is a much-needed reminder to police to act on hate speech before it becomes hate crime. That the police is educating its ranks to confront hate speech in society is recognized by many as a timely initiative. Whether the implementation of the circular would actually lead to abuses is a concern that must be addressed by the government. The suspicion that the police will distort the circular's apparent mission for its own ends reflects the public’s generally low perception of law enforcement. It does not help that the government has enacted several laws and policies in the recent past containing provisions that undermine individual rights.